Debunking Rosa Parks Myths. Again. Because People Are Stupid. Jezebel ran a story today that involved the historical narrative of Rosa Parks. I noticed a few comments that refer to a rather simplistic and reductive view of who she was — a version often found in textbooks, including mine as a child. I can't tell whether it's because Rosa was black or a woman or both but some historical accounts want to reduce and dilute her role in the civil rights movement to a solitary incident. Here are some debunked common myths about Rosa Parks and her arrest. *Rosa Parks wasn't old. She was 42 at the time. *Rosa Parks was not just a seamstress but she also worked for her local NAACP chapter. *The bus driver asked her to move, not the white passenger. *Rosa Parks didn't confront the white passenger and tell him off. *She was not sitting at the front of the bus. She was sitting in the middle. White people got on, and there weren't enough seats for them. The bus driver was moving the segregation line closer to the back to make room for the whites. That's when he asked Rosa to move. *Rosa Parks wasn't the first person to refuse to give up her seat on a bus to a white person. 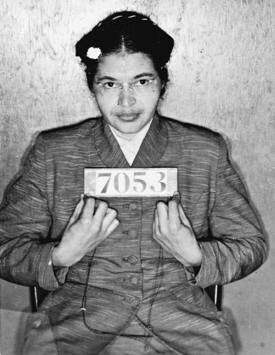 *Rosa Parks' arrest didn't start the civil rights movement; her arrest started the Montgomery Bus Boycott. *Rosa Parks wasn't just a faceless, blue collar worker. She was also a community leader and civil rights activist before that arrest. Her involvement in the civil rights movement is not accidental. I seriously hope that these Rosa Parks myths aren't being passed around as a way to reduce the importance of a black woman who became powerful enough to help ignite a major change in her community and eventually the rest of the country.